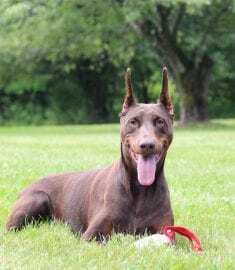 I have been in the Doberman breed since 1980, the breed health has steadily declined due to the extremely small gene pool, I have Afina AND Alexondrea her daughter BOTH stored to clone down the road. They have healthy pedigrees and lines that can not be replaced. They BOTH are the loves of my life – and BOTH girls own me like no other dogs I have ever owned. They are Brilliant, Compliant and LOVE to work! Hopefully more breeders put healthy dogs into your program and MAYBE – JUST MAYBE their will be hope for the breed I have dedicated my life to.